ALBANIA, 1394.82 KHz (Drifted from 1395), Trans World Radio (TWR), probably in Croatian. Edited to get the clip short until listening to the Interval signal. ALBANIA, China Radio International on 1458 KHz (1457.575) with a nice ID - Now listen to the very nice Interval signal of Radio Tirana. AUSTRIA, 1476 KHz Österreich 1. ID "Österreich Eins" with mention of imminent closure of the channel. Thanks to Hans Pammer for pointing out. Österreich 1 went off the air definitely four days later, on December 31st 2008 at 23:10 UTC. That was the last Austrian MW channel. BELARUS, Belaruskaye Radio 1 at 279 KHz. This one had to be played using a very tight bandwidth due to close beacon signals. Nevertheless, the speech is clearly present on this recording. This is the best I could get from this station so far. BELGIUM, former 1512 KHz, Radio Vlaanderen Internationaal with ID and newscast in Dutch. They went off this frequency in March of 2008. BELGIUM, Listen also to former VRT 1 at 927 KHz when signing off and with a good signal. BELGIUM, French network RTBF, Vivacité at 1125 KHz with TOH announcement - Here’s another cut from Jan 2018 with local ads NEW. BELGIUM, RTBF International at 621 KHz in French signing in. BULGARIA, Radio Bulgaria at 1224 KHz with clear ID after Interval signal. Here is another clip with ID in Serbian "Radio Bugarska". BULGARIA Radio Bulgaria at 747 KHz over Holland with Interval signal. BULGARIA, Radio Horizont at 1188 KHz with woman's voice in Bulgarian. BULGARIA, Radio Horizont at 963 KHz with time pips followed by the news in Bulgarian. Thanks to Dmitry Mezin for IDing the language. Listed between 5 and 40Kw. BULGARIA, R.Horizont at 576 KHz. Not so easy to hear even though its carrier is spotted regularly. This is due to strong adjacent domestics (CFRA to name one) combined with an apparently low modulation (2018/10). NEW. 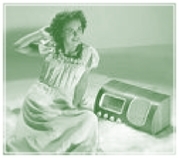 BULGARIA, Radio Horizont at 1161 KHz with "Horizont" ID at the first second of the clip. CANARY ISLANDS, 1008 KHz Punto Radio with ID. CANARY ISLANDS, Radio Nacional on 621 KHz. Nice signal here. CROATIA, Hrvatski Radio at 1134 KHz. One of the most regular a fairly easy TA here. In the following clip, ID "Hrvatski Radio" right after time pips - Here's another example how it sounds when peaking strong. CYPRUS, BBC World Service at 1323 KHz with BBC mention. CYPRUS, RIK1 - Proto R. At 963 KHz. A refreshing change from the usual Tunisia and Iran. NEW. CZECH REPUBLIC, Ceský Rozhlas 1 at 270 KHz. with ID "Radiozurnal" before the music - Here’s another cut with a good signal and a couple of IDs along the way - Now another sample this time on their 50 KW reduced power but fortunately, under quite good LF conditions on that Jan 14, 2018 night. NEW. CZECH REPUBLIC, Ceský Rozhlas 2 at 954 KHz. A good catch with ID "Ceský Rozhlas" at second 10. Thanks to Jürgen Bartels for pointing out - Here ten years later at he end of 2018, after paying attention to the station once again, I heard this nice ID NEW. CZECH REPUBLIC, Ceský Rozhlas 6 at 1332 KHz with man in Czech with a comment regarding France. Thanks to Karel Honzik for ID. CZECH REPUBLIC, Ceský Rozhlas 2 at 639 KHz. Despite its high power, it is not heard as frequently as 954 at my location - Another 639 rare show up, this time on Jan 20, 2018.NEW. CZECH REPUBLIC, Radio Dechovka at 1233 KHz with multiples IDs on Jan 20, 2018 NEW. DENMARK, former Denmark Radio Program 5 at 1062 KHz when signing in with strong signal. DENMARK, DR Radio on 243 KHz on longwave. With their low power and very limited schedule, I would put DR in the hard-to-catch variety - Here’s another shot with a very descent signal. ESTONIA, TWR Relay at 1035 KHz with Russian talk UPDATED. Here it is with Russian pop NEW. FAROE ISLANDS, Kringvarp Føroya on 531 KHz. Music then ToH signal and a likely newscast in Faroese - After a long wait, here it is back again on 01/2019 with Faroese talk and with a much reduced power with 10 KW compared to the 100 KW they were having back in 2009. NEW. FINLAND, CRI relay in Pori on 963 KHz for its Radio Kitaya's program - Here's another moment this time with larger bandwidth - Check this next one with pips and a nice ID - Now this will probably be the last one thanks to this HUGE signal. FRANCE, Radio France Inter on 162 KHz. A frequent guest here. In this clip you'll hear good signal with typical Summer LW noise burst. FRANCE, 216 KHz Radio Monte Carlo on longwave with a few IDs. FRANCE, Corsica 1494 KHz ID "France Bleu" at the beginning of the clip. Thanks to Dario Monferini and André on mwdx for backing in this ID. FRANCE, with Corsica again 1494 KHz Frequenza Mora with probably a New Year's Day special phone-in program in Corsican. Popped in with good strength. FRANCE, 1377 KHz France Info, Lille. A nice clear recording with ID. FRANCE, 837 KHz France Info, Nancy. That Summer night, its reception was outstanding. See the Perseus window for its carrier. Left in AM mode at the widest setting with tolerable QRM. FRANCE, 1557 KHz Nice-Fontbonne with very little QRM this time - Here’s a great shot now with the transmitter site re-located at the Col de la Madone, near Monaco. FRANCE, France Info at 711 KHz with weather. FRANCE, Bretagne 5 at 1593 KHz with ID related to their test program (*2013 note: after a couple of weeks testing one year ago, it went off the air and never reappeared). GERMANY, 153 KHz Deutschlandfunk over Algerian time pips. ID "Deutschlandfunk" at second 3. GERMANY, 177 KHz, Deutschlandradio Kultur with a very nice ID. GERMANY, 183 KHz, Europe 1 when signing in at 02:00 UTC. A nice July catch here in Eastern Canada - Listen here to another version of Europe 1 signing in with typical Summer burst of noise and with a good signal. GERMANY, 183 KHz, Europe 1. Programs in French transmitted towards France. Transmitter facilities are located just a few meters from the French border. GERMANY, 936 KHz Radio Bremen 1 with ID "SDR-1" prior to time pips. GERMANY, 1323 KHz Voice of Russia. Very good signal strength with Interval signal and program in French "...Ici Moscou" followed by full ID and frequency listing. GERMANY, NDR info at 972 KHz with nice ID. GERMANY, at 1017 KHz with MDR Info ID. GERMANY, 1539 KHz Evangeliums Rundfunk from Mainflingen with station info in German. GERMANY, 1269 KHz Deutschlanfunk from Neumünster with ID and news. GERMANY, DLR Kultur at 990 KHz barely over my semi-local Montreal's CKGM. GERMANY, Deutschlandfunk at 1422 KHz with class signal. Germany's most regular here. GERMANY, Voice of Russia in Russian at 693 KHz mixed with BBC 5 Live. GERMANY, American Forces Network (AFN) at 873 KHz with music and “Power Network” mention. GERMANY, Voice of Russia on 1431 KHz in Russian. GREECE (Crete), 1512 KHz ERA, Chania. Was heard for a few days. Nice signal here with a kind of an Interval signal at the beginning. At transmitter sunrise hour. Thanks to Juan Antonio Arranz and John Plimmer for backing up this catch - Here's another sample almost two years later of that same station - Here it is booming in April of 2011. Unfortunately, they obviously had sound quality problems - Now on Sept 2nd 2015 at 3:00, this nice ID. GREECE, ERA Spor at 981 KHz with talk program then ID "Elliniki Radiofonia" at sec.54. GREECE, NET (ERA 1) at 729 KHz popping up during a rare QRM break from CKAC 730. Thanks to Vlad Titarev at RealDX for language ID. GREECE, Pirate station on 1625 (1624.98)KHz. Liagkas Zaxarias listened to the clip and heard “Anatolia” or “Anatolion” and he said that the station was from Kilkis, in Northern Greece. GREENLAND, former KNR Simiutaq at 720 KHz at my local sunset just before WGN hits my antenna. Music probably in Danish, ID or time announcement in Inuit then program in Danish. Thanks to OJ Sagdahl at Realdx for confirmation - The following is a recording of a program probably in Inuit this time mixed with WGN - Here's another shot with jingle and talk program - Finally, a nice cut with National Anthem and ID followed by news in Danish. HUNGARY, Magyar Katolikus Rádió at 1341 KHz over BBC Radio Ulster. ID at second 31. Thanks to Henrik and Björn at Realdx for their help - Here's another clip including a nice ID. HUNGARY, Vatican Radio program via Magyar Katolikus Rádió at 1341 KHz. While BBC ID just had time to break in at the beginning of the clip, ID "Itt a Vatikanyi Rádió" is heard at second 27. Thanks to Mauno and Mauricio at Realdx. HUNGARY, MR1 - Kussuth Rádió at 540 KHz with massive signal well over CBT (end of 2018) NEW. HUNGARY, Dankó Rádió at 1116 KHz, likely from the Miskolc tx (end of 2018) NEW. ICELAND, RUV RAS 1, at 189 KHz strong as a local. End of music, jingle and news: Listen - Here’s another shot again as a local with ID - ...and here with a monstrous signal! - Sorry but I couldn’t resist adding another one. ICELAND, RUV RAS 1 at 207 KHz. A difficult catch here. Fortunately, it came trough not too badly on that night of Feb 14, 2018 at 4:21 UTC NEW. IRELAND on LW at 252 KHz with ID "...RTE Radio One". Caught at transmitter sunrise hour. Signal strength was stronger than usual killing all surrounding NDBs. ITALY, RAI 1 at 657 KHz. I think this must have been coming from the Torino outlet. Napoli is one of those 24/7 while others including Torino’s sign off at 23:00 UTC. Near minute three, ID and then signing off - Here it is at the end of 2018 from Pisa, here with Radio-Theatre NEW. ITALY, RAI Radio 1 at 1062 KHz with nice Italian romantic music - Here, an unusual program at odd hours (04:30 UTC) probably for Easter time and/or earthquake event. Very nice signal though! ITALY, RAI Radio 1 at 1449 KHz. A surprise that it popped up instead of more often heard Libya. ITALY, RAI 1 at 1575 KHz. Finally, I could nail down an ID. Heard at times in the past but always with unpleasant rapid and deep fades - In Feb 2019, there it was with ID and news items NEW. ITALY, RAI Radio 1 at 567 KHz with ID. This is a quite rare visitor here. LITHUANIA, Radio Svoboda, Sitkunai on 1386 KHz (10-02-2015 2:30) with Russian talk. A seldom new European country. Thanks to Mike Shcherbakov and Jari Savolainen at RealDX or Id’ing - Another shot here at the Lithuanian relay, this time with the beginning of an NHK World program in Russian (01-09-2017 3:30 UTC) - Again showing up regularly in Nov 2017 with Russian talk and ID “…Radio Svoboda” - Here again showing up on Oct 2018 at good strength with multiple IDs NEW. LUXEMBOURG, 1440 KHz RTL Relay-Radio China International "...Ce programme vous est présenté par Radio 86 en collaboration avec RT Luxembourg et Radio Chine International..." Complete and detailed ID in French and shortly after that, beginning of a French program by a woman with a Chinese accent. LUXEMBOURG, 1440 KHz China Radio International with French programming. Even more impressive than the previous clip. Caught a couple of days after. Now, Here's English programming and this 3 min clip including full ID both coming in HUGE. MACEDONIA, Makedonsko Radio 1 at 810 KHz with talk in Macedonian. Not an easy one considering the WGY pest. A surprising mi-April catch though. MOLDOVA, 999 KHz Radio Mayak (VOR). AM mode used. A clear cut with several IDs and nice Russian pop music. MOLDOVA, Relay on 1548 KHz with Voice of Russia with a program in Serbian. Note that you can hear Kuwait underneath. Thanks to Mauno Ritola and Jürgen Bartels for helping me ID - Here with a TWR program in Romanian. Heard in Nov 2017. MOLDOVA, from the 999 KHz relay. End of the TWR programming then clear Interval signal followed by Voice of Russia programming - Now listen to a complete ID of “Gollos Rossii” - Here on Nov 2018 with TWR Interval Signal followed by Romanian programming NEW. MOLDOVA, Radio Pridnestrovye at 1413 KHz in Russian. Thanks to Walter Salmaniw and Karel Honzík at RealDX for helping ID - Now here’s on 1413 the relay for Russia’s Vesti FM - Another cut here with ID, this time from Oct 2018 NEW. MONACO, 702 KHz China Radio International. Col de la Madone relay. Music is on this clip. I had the ID after the recording. NETHERLANDS, 1395 KHz The Big L. ID around the end of the clip. I've been listening for about an half hour at this station along with the Internet stream. There was that button on their web site "Email to the studio" what I did. I was just asking for an "Hi" and hoping that when the DJ will mention that I'm listening from Canada on 1395, unfortunately, when this happened, I was still recording but the reception was too poor. No such luck this time. After being off for some time, Big L is back on air - Here's another clip from that same station with ID followed by German song "Weil ich ein Mädchen bin". Thanks Jürgen Bartels for the song's info - Listen here to my best reception of the station so far. NETHERLANDS, 1602 KHz, Radio Seagull popping up briefly with web address and ID "Radio Seagull". Listed at 1 Kw. NETHERLANDS, GrootNieuwsradio at 1008 KHz with good signal and ID - Here again nearly ten years after, just weeks before to their closure which occurred on 12/31/2018 NEW. NETHERLANDS, Radio Maria on 675 KHz with a couple of IDs. NETHERLANDS, Radio 5 at 747 KHz with news in Dutch. Often heard with great signal during Fall and Winter months. NETHERLANDS, Mighty KBC on 7375 KHz on 41m. Massive signal with a very catchy program. It’s listed here just because I love that kind of radio! NORWAY, former NRK 1 at 630 KHz. My lone MW Nowegian. ID at sec.16 "Her er NRK dagsnytt klokka ett" Thanks to my Norwegian dx friends on RealDX for station ID details. NORWAY, NRK 1 on 153 KHz, at least after a long wait and with a good signal (Jan 2013). POLAND, 225 KHz Polskie Radio on longwave with ID and the news UPDATED - This next clip came with a full ID. PORTUGAL, 963 KHz Radio Renascença with Portuguese talk. PORTUGAL, 594 KHz, Rádio Sim with ID at second 26 by a female voices chorus. PORTUGAL, Rádio Club on 1035 KHz with ToH time pips and a nice ID (now became Star FM). ROMANIA, Antena Satelor on longwave 153 KHz with a nice ID at sec.16. ROMANIA, Radio Iasi at 1053 KHz over UK's TalkSport. ID "Radio Iasi" at second 9. Thanks to Dmitry Mezin for helping ID - Here's another clip caught on other time with Romanian talk. ROMANIA, Radio România at 1152 KHz with programming ads and a clear ID before TOH pips. ROMANIA, Radio România-Antena Satelor at 1314 KHz with Romanian talk - Here's another clip with "Antena Satelor" ID at sec.35. Listed between 10 and 25Kw. ROMANIA, Radio Cluj at 1593 KHz. Thanks to Mauno Ritola for having recognized the ID. ROMANIA, România Actualitati on 1593 KHz mixed with another unID Romanian. ROMANIA, Radio România Actualitati at 1332 KHz with Romanian talk. Listed at 50Kw. ROMANIA, Radio România Actualitati at 1179 KHz while Radio Sweden wasn't on the air - Here is another clip with an even better signal - Next, I would add this nice clip including this quality ID - Here it is again at the end of 2018 with massive signal NEW. ROMANIA, This is an unID Romanian at 909 KHz. Nevertheless, I found it interesting here when mixed with UK's BBC Five live - Another shot here, there giving a hard time to UK with a relatively good strength. There’s a weaker Radio Romania Actualitati ID at the end and that one is listed at 50 KW. ROMANIA, România Actualitati on 855 KHz. Not an easy one since Spain usually live there. Another problem is how 855 gets splattered here. Fortunately, this time signal level was good enough to break through in a good way - Another sample here, this time from Jan 19, 2018 NEW. ROMANIA, România Actualitati on 1404 KHz coming in nicely. ROMANIA, SRR Radio România Actualitati on 1458 Khz from Constanţa. Thanks to Mauno Ritola at RealDX for ID. Here it is again mixing with UK. ROMANIA, Radio Romania Actualitati on 756 KHz here with Radio-Theatre (2018/11) NEW. ROMANIA, Radio Romania Actualitati on 603 KHz, here featuring two synchronized transmitters (2018/11) NEW. RUSSIA, Radio Rossii, Bolshakovo on 171 KHz.Very nice "Radio Rossii" ID. RUSSIA, Radio Rossii, Taldom (near Moscow) at 261 KHz. Former world’s most powerful transmitter with 2500 KW! (2012 update, now with 500 KW). In this clip, strong enough to make its way through many close NDBs. Transmitter was at grayline hour, a few minutes before sunrise. I heard it on other occasions but much weaker than that - In this next one, there's the ID "Radio Rossii". RUSSIA, Radio Mayak at 1143 KHz probably from Bolshakovo. Man in Russian followed by a short news jingle then woman in Russian too. Thanks to Mauno Ritola and Bjarne Mjelde at RealDX for helping ID - Here's a nice clip on another occasion with Interval signal. RUSSIA, Voice of Russia Yevangelskiye Chteniya at 1089 KHz from Tbilisskaya in Eastern Europe 300 Km North of the Georgian border. Popped up under UK's TalkSport - In this next clip, at 1089 VoR- Radiokanal Sodruzhestovo came stronger clearly revealing Russian talk over TalkSport. Thanks to Maksim Ivanov for this one ID. RUSSIA, Radio Kavkaz at 171 KHz with superb signal and full ID "....Vefire Radio Kavkaz Radiokompanii Golos Rossii". For a moment, I had two Russians at the same time. That was before Kaliningrad signed off. I'm really happy with this LW coming from the Caucasus region. Thanks again to Dmitry Mezin at RealDX for ID. RUSSIA, (Kaliningrad) Radio Mayak at 549 KHz with chimes, time pips and news in Russian. RUSSIA, (Kaliningrad) Voice of Russia at 1215 KHz with ID in English. RUSSIA, (Kaliningrad) Radio Rossii at 873 KHz with Russian talk. The ID was heard a bit later but with a weaker signal - In this clip from the same listening session, synchro echo was heard from sec 44. I would guess that the second TX comes from Lesnoy, near Moscow. RUSSIA, RTV Podmoskovye at 846 KHz from Elektrostal in the Moscow suburb with pre-sign in tones. Thanks to Mauno Ritola and Nigel Pimblett for backing my assumption. SERBIA, Radio Beograd 1 at 1107 KHz with man in Serbian. Thanks to my friends at RealDX for language ID. SERBIA, with Radio Beograd 202 on 1503 KHz popping up briefly including ID “programa Beograda dvesto dva...” . Tnx to Jari Savonainen & Alessandro Gropazzi at RealDX for their help. SLOVAKIA, Sro3 - Rádio Devin on 1098 Khz (actually 17 Hz bellow) here delivering audio on a rare occasion. Thanks to an Hungarian Dxer named Jozsi on the RealDX list for ID NEW. SLOVENIA, former Radio Slovenija 1 on 918 KHz in Slovene. SLOVENIA, Radio Slovenija International on 1170 KHz popping up during a minute of open carrier from WWVA. Thanks to Vlad, Mauno & Alessandro at RealDX for helping. SLOVENIA, R.Murski Val on 648 KHz with Slovenian talk NEW. SPAIN, Radio Euskadi at 756 KHz with good signal and ID. Listen to this other clip of the same station. Listed between 5 & 10Kw. SPAIN, Radio Nacional de España (RNE5) at 603 KHz. SPAIN, RNE 5 at 531 KHz with ID. SPAIN, SER Radio Pontevedra at 1116 KHz with a nice local ID. SPAIN, Euskadi Irratia at 1476 KHz with a nice ID in Basque language. SPAIN, Radio Euskadi at 963 KHZ with ID in Spanish. Listed between 5 & 10 Kw. SPAIN, Euskadi Irratia at 1386 KHz (+50hz) with ID and Basque program. SPAIN, Radio Vitoria at 1602 KHz with a nice ToH ID. SPAIN, COPE at 1296 KHz. Not a so frequent visitor here. SPAIN, SER Radio at 1287 KHz with full ID. SPAIN, COPE, Madrid at 999 Khz (11-13-2016 21:57 UTC) with this nice ID. SPAIN, Marine weather on 1677 USB from Cabo de Peñas. SWEDEN, former 1179 KHz Radio Sweden International with programming in German and ID. SWEDEN, formerly on 1179 KHz and one of the nicest ID I ever heard courtesy of Radio Sweden International. SWITZERLAND, Radio Suisse Romande - Option Musique at 765 KHz. An early August catch. Radio was set on AM and I had a very nice signal with very few QRM which normally prevail - The mediumwave service of Option Musique aired its last program on December 5th of 2010 at 23:00 UTC. Then, a loop message was played until December 31st inviting listeners to syntonise from now on their FM broadcast. The transmitter was shut down definitely at 23:00 UTC. Karel Honzik kindly sent me recordings of each of those historical moments as he heard in the Czech Republic. First, the last minute of programming and second, transmitter shut down right on cue. SWITZERLAND, legendary DRS 531 KHz from Beromünster. It went off the air on December 28th of 2008. Fortunately, I had time to record something before switch off. 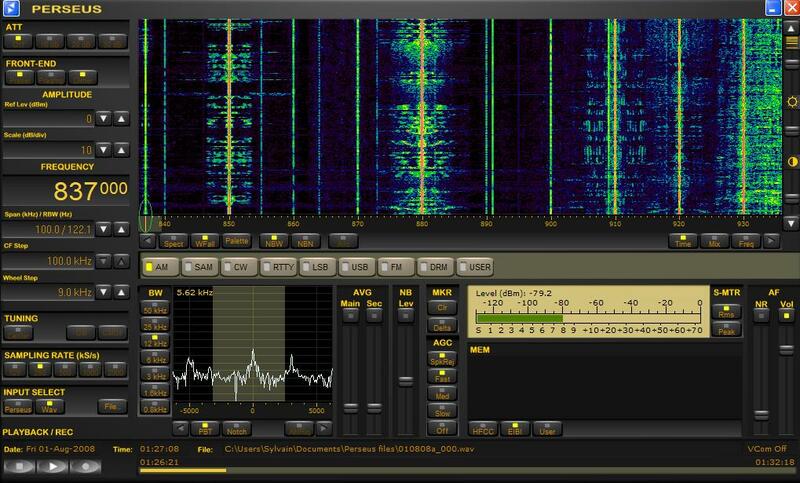 TURKEY, longwave 180 KHz TRT 1 during Ramadan. I've noticed carriers before and weak audio but nothing like this during an interesting musical sequence - Later, location ID by female announcer "...Ankara..Dan (from Ankara) thanks to Udo Deutscher for pointing out. TURKEY, TRT 1-Radyo Bir, Antalya on 891 KHz (11-15-2016 4:32 UTC). With the Perseus’ notch taking care of a 1 KHz test tone coming from Algeria, the woman’s talk in Turkish could be heard more clearly. Thanks Vlad Titarev for language ID and also thanks to the PEI 2016 DXpedition and Allan Willie in NFDL for the tips. TURKEY, TRT1 - Radyo Bir on 954 KHz, here peaking with nice music on Nov 2018 NEW - There with Turkish talk on Jan 2019 NEW. UKRAINE, Ukrainske Radio 1 at 972 KHz mixing over Germany NDR. Thanks to Vlad Titarev for ID Ukrainian language - Here’s a better shot in late 2012. UKRAINE, Ukrainske Radio 3-Radio Kultura formerly at 1431 KHz instead of VOA Radio Sawa. First clip with time pips and ID and the second clip with ID "Radio Kultura" within a musical program - Here, another interesting segment with nice signal but without ID - In this next one and shortly after a weak ID, signal caught some strength revealing this relaxing jazz music. For about a week around Christmas of 2008, I had daily reception of this station. 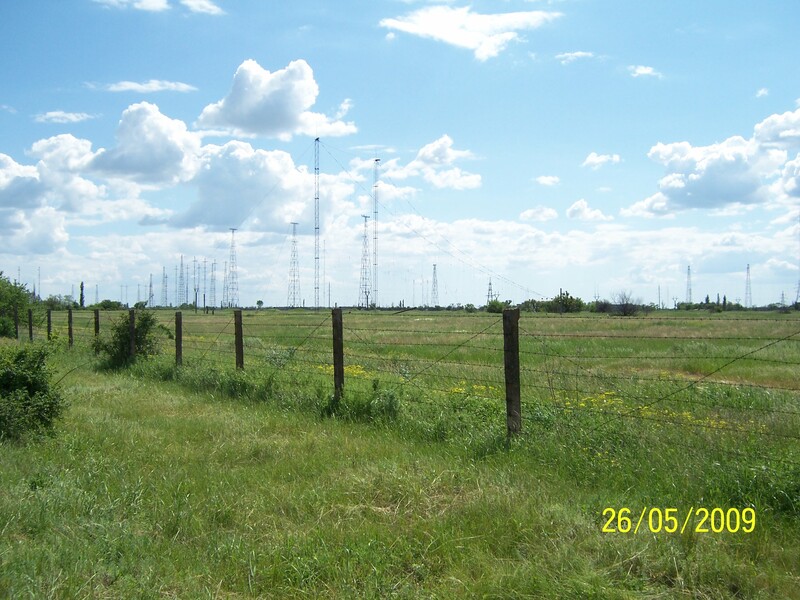 Ukrainian DXer Slava Loginov came across my website and kindly sent me photos of the 972 and 1431 KHz Ukrainian Radio site near Nikolaev. Check that one - After being silenced for a couple of years and since being re-activated in Dec of 2014, I finally could hear again UKR 1431. The following is from Nov 28 of 2017. UKRAINE, UR3 on 1278 KHz with classical music and Ukrainian talk. Heard on 01/2018 NEW. UKRAINE, UR1 - Persha Prog on 549 KHz with Ukrainian talk. Tnx to Walt Salmaniew and Vlad Titarev on RealDX for helping ID NEW. UNITED KINGDOM, TalkSport, huge on 1089 KHz with ads and IDs. This station is one of the most reliable TA as demonstrated in this next clip. Again, another recording with massive signal. UNITED KINGDOM, 1215 KHz, Absolute Radio (former Virgin Radio) with diaper ad and ID. Nice quality signal. UNITED KINGDOM, 1341 KHz BBC Radio Ulster with ID. UNITED KINGDOM, GOLD Radio at 1458 KHz. I was fortunate to hear it just a moment after Albania has its transmitter shut down. At sec.7, "...from Manchester, this is GOLD". Listed at 5Kw. - More of the UK 1458 fx, this time from Lyca Radio on Nov 2017 NEW. UNITED KINGDOM, Birmingham's Radio XL at 1296 KHz. I thought first in Afghanistan but my friends at RealDX quickly pointed out to Radio XL. Nevertheless, I'm quite happy with this catch since the station is listed at 10Kw. Heard from time to time here. UNITED KINGDOM, TalkSport at 1053 KHz. A quite steady station here. UNITED KINGDOM, Sunrise Radio at 1458 KHz with traffic and ID. UNITED KINGDOM, BBC 5 Live at 909 KHz. Heard as usual coming from two different TX producing the echo sound. UNITED KINGDOM, BBC Radio Bristol on 1548 KHz with ID “BBC Radio Bristol” at sec.51. UNITED KINGDOM (Scotland), Clyde 2 at 1152 KHz. First time noticed here in late 2012. Now another cut from Fall 2013 when popping in. UNITED KINGDOM, Kismat Radio at 1035 KHz. Another great surprise in late 2012. There is so much DX to be discovered in the UK!. UNITED KINGDOM, BBC Radio Wales on 882 KHz with full ID from Jan 2018 NEW. UNITED KINGDOM, BBC Radio Scotland on 810 KHz with Scottish folk music and ID NEW. UNITED KINGDOM, Manx Radio at 1368 KHz. Another one of the “not-so-easy-to-hear” variety with ads and a “Manx Radio - Weather” ID NEW. VATICAN CITY STATE, 1611 KHz Vatican Radio with Interval signal then religious programming in Bulgarian (EMWG). VATICAN CITY STATE, 1530 KHz with a program in Polish (EMWG-WRTH) about the Pope visit to Angola including a couple of speeches’ short extracts in Portuguese. Here with Radio Vatican program in French including ID, over unID domestic. VATICAN CITY STATE, 4005 KHz (4004.76), Vatican Radio on the 75m band. Slavic programs with Interval signal between both.